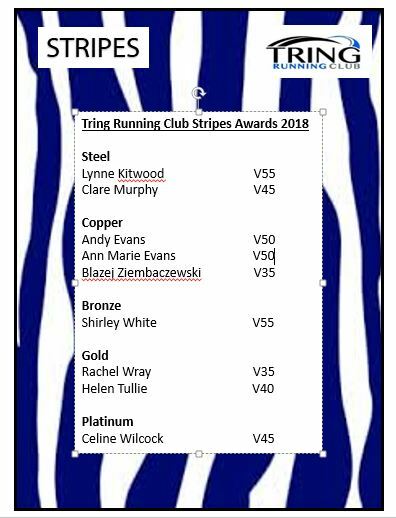 Stripes are levelled awards for TRC members that provide a means to encourage, inspire, motivate and celebrate each member’s achievement and progress over time at Tring Running Club. Having a goal to strive for helps focus and motivate us all. and must be achieved over a year (from January 1st to December 31st). Apart from the first level, Steel, which has no time specification, the levels are age-graded, starting at 45% in 5 year bands, with the intention of keeping things simple in terms of times to aim at, and also providing a bit of healthy competition and comparison within the club. 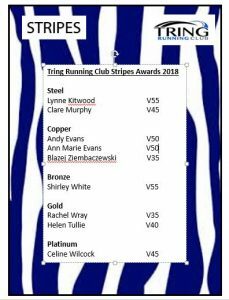 You will then have your award read out at club night (as soon as it is earned) and be presented with your certificate at Presentation Evening/another club event.